30 October 2008, at 11:50a.m. 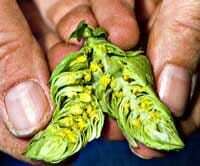 US - USDA Agricultural Research Service (ARS) scientists have found that extract from hops can help control <em>Clostridium perfringens</em>, the bacterium causing necrotic enteritis in poultry. Hops contain substances that control pathogenic bacteria in the intestines of chickens, ARS scientists and cooperators have reported. Certain bacteria in the intestines of chickens not only can cause contamination of meat during processing but also may pose major production losses by causing disease in the broiler chicken. Currently, poultry producers use sub-therapeutic amounts of antibiotics in poultry feed as growth promoters and to control bacterial pathogens or parasites. However, bacteria can become resistant to the antibiotics, so ARS scientists are looking for alternatives. A compound in hops called lupulone was found to be possible replacement for low levels of antibiotics as a way of controlling some pathogenic bacteria in chickens. The hop plant (Humulus lupulus) contains bitter acids known to be potent antimicrobials. One of these compounds, lupulone, was thought to control levels of the disease-causing agent Clostridium perfringens in chickens. ARS scientists, working under a cooperative research agreement with hops producer Hopsteiner in Yakima, Washington, examined the effect of feeding different concentrations of lupulone to broiler chickens to determine the compound's impact on Clostridium populations in the intestinal tracts of birds inoculated with C. perfringens. A research team led by microbiologist Gregory Siragusa, formerly of the ARS Poultry Microbiological Safety Research Unit in Athens, Georgia, in collaboration with Gerhard Haas of Fairleigh Dickinson University in New Jersey, delivered different concentrations of lupulone via water to chickens inoculated with C. perfringens. After 22 days — the timeframe associated with clostridial disease in broiler chickens — C. perfringens counts were significantly reduced in the lupulone-treated group compared to another group of chickens that did not receive the lupulone treatment. The reductions ranged from 30 to 50 percent. According to the team, the potential for lupulone as an antibiotic alternative in poultry rearing is feasible based on these results.